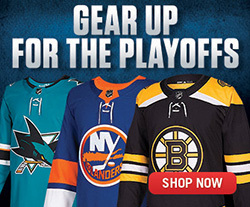 Who was this Stanley guy and why is hockey's most prestigious trophy named after him? Frederick Arthur Stanley was born in London, England on January 15, 1841, the younger son of three-time Prime Minister of England, Edward George Geoffrey Stanley, the Fourteenth Earl of Derby. Educated at Eton and later at military college, Frederick received his commission in the Grenadier Guards, but opted instead for a political career, following the path of both his father and his brother. He was elected as a Conservative Member of Parliament for Preston, and later represented North Lancashire and Blackpool in the House of Commons. Lord Stanley was a Member of the British Parliament between 1865 and 1886, including a term as Secretary of State for the Colonies in 1885 and 1886. From 1886 to 1888, Stanley was president of the Board of Trade. 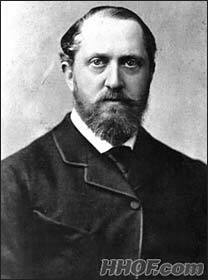 Lord Frederick Arthur Stanley was born into one of the oldest aristocratic families in England when he entered the world on January 15, 1841 in London, England. On June 11, 1888, Lord Stanley succeeded the Marquis of Lansdowne as the sixth Governor General of Canada, appointed by England's reigning monarch, Queen Victoria. Stanley's full title was the Right Honourable Sir Frederick Arthur Stanley, Earl of Derby, Baron Stanley of Preston, in the County of Lancaster, in the peerage of Great Britain, Knight Grand Cross of the Most Honourable Order of the Bath. Although Lord and Lady Stanley split their time between both official residences of the Governor General (Rideau Hall in Ottawa and the Citadel in Quebec City), Frederick discovered, much to his delight and to the astonishment of those who knew him in England, the joys of Canada's forests and rivers. He built a large summer home called Stanley House in order to indulge his love of fishing. It was located on the Baie des Chaleurs near the mouth of the Grand Cascapedia River on the Gaspe Peninsula. Today, Stanley House is a charming bed and breakfast destination. Lord Stanley's five-year term in office as Governor General was primarily comprised of helping Prime Minister John A. MacDonald guide the fledgling nation through precarious political times, but is best remembered for his incomparable legacy to hockey. While in Canada, Stanley's children discovered exciting new winter pursuits, including snowshoeing, tobogganing, skating and playing hockey. 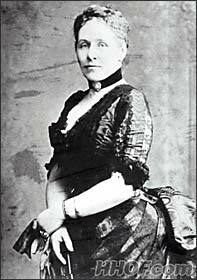 On February 4, 1889, Lord and Lady Stanley, along with daughter Isobel and one of their six sons, Edward, witnessed their first hockey game, a spotlighted event during the annual Montreal Winter Carnival. Lord Stanley expressed "delight" at the game and the skill of the players. Although neither Frederick nor Constance, his wife, ever played hockey, the passion for hockey was fuelled in great part by the enthusiasm of the Stanley children. Sons Algernon and Arthur formed a competitive hockey club called the Rideau Rebels, which occasionally included their brother Edward. Isobel was one of the first female hockey players in Canada, pulling together games on the Rideau Hall Rink that included secretaries from Parliament Hill. After observing his first hockey game on February 4, 1889, Lord Stanley and his family discovered a passion for the sport that helped launch it into the spotlight as Canada's favourite sport. After being persuaded by several of those closest to him, most notably his children, to donate a trophy to hockey, Lord Stanley agreed. On March 18, 1892, the Governor General asked Lord Kilcoursie, a vice regal aide who played on the Rideau Rebels with Stanley's sons, to read a letter on his behalf to the Ottawa Athletic Association. Lord Stanley's offer was enthusiastically accepted, and he subsequently requested one of his aides, Captain Colville, to purchase an appropriate trophy. Known originally as the Dominion Hockey Challenge Cup, the trophy was purchased for ten guineas (just under $50 at that time, a considerable amount) and was immediately known as the Stanley Cup. At a banquet in 1892, Lord Stanley promised to donate a trophy to hockey that would be used for the amateur championship of Canada. That trophy, originally named the Dominion Hockey Challenge Cup (seen above) has served as the focal point for professional hockey for over 113 years. The silver bowl was created in Sheffield, England but purchased in London, England and stood 7.28 inches tall and 11.42 inches in diameter. 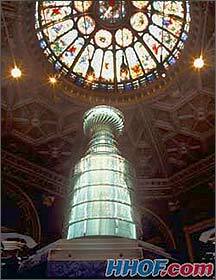 Today, this original Stanley Cup is kept on permanent display at the Hockey Hall of Fame. Lord Stanley insisted that the Cup remain a challenge trophy, presented for the amateur championship of Canada, and never become the property of any one team. 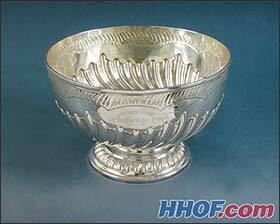 The first Stanley Cup winner was the Montreal Amateur Athletic Association in 1893 (although they refused to accept the trophy until a year later). In 1910, after having being awarded to both amateur and professional teams, the Stanley Cup was awarded exclusively to professional teams. From the National Hockey League's formation in 1917 until 1926, the magnificent trophy was awarded to the winner of a playoff between the NHL and the Pacific Coast Hockey League. 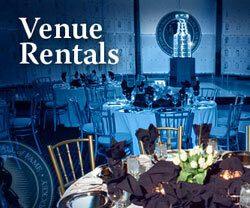 When the PCHL dissolved in 1927, the Stanley Cup was presented exclusively to NHL playoff champions. Lord Stanley never witnessed either a championship hockey contest or his namesake trophy presented to a championship team. Stanley's term as Governor General was scheduled to end in September 1893, however, in April of that year, Stanley's brother, the 15th Earl of Derby, died. Frederick immediately became the 16th Earl of Derby, and it was required that he return to the Liverpool area to oversee the family land holdings and businesses. 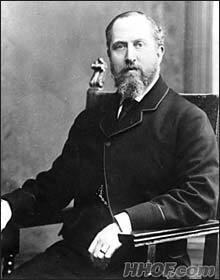 Stanley resigned as Governor General and on July 15, 1893, returned home to England. In his twilight years, the 16th Earl was appointed president of University College (replacing his deceased brother) and when the University of Liverpool was established in 1903, Stanley became the university's first Chancellor. Between 1895 and 1896, the 16th Earl of Derby served as the First Lord Mayor of Greater Liverpool and also later served as Mayor of Preston. Lord Stanley died at Knowsley, in Lancashire, on June 14, 1908. The Stanley Cup Journal introduces you to the Keepers of the Cup on Tuesday. These four gentlemen braved long drives, frantic schedules, lack of sleep and overzealous fans in order to ensure that the Stanley Cup arrived at each of the Ducks' homes safely and on time. You'll meet Mike Bolt, Walt Neubrand, Phil Pritchard and Bill Wellman, the valiant men behind the scenes, when we all gather here again on Tuesday. Be safe!